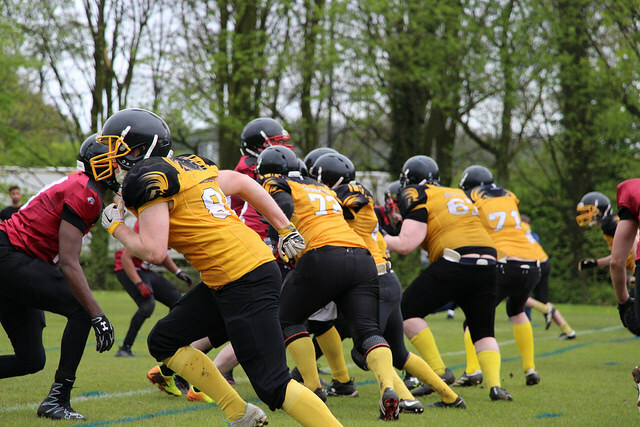 Lancaster Bombers got the weekend off to winning ways against York Centurions with a dominant 26-8 victory on Friday afternoon. Lancaster thoroughly deserved this victory – bettering their rivals in all areas of the field, including the stands! A slightly shaky start for Lancaster with a few handling errors was quickly rectified following a sending off for the visitors, after persistent displays of ‘unsportsmanlike behaviour’ forced the referee to get involved after just a few minutes of play. This handed the Bombers a real advantage that was capitalised on fully, drawing out an 18-point lead before half time – largely courtesy of a strong showing by quarterback Ben Ackroyd and his attacking cohort. Although being pegged back slightly in the second half, the class of Lancaster was clear and it was fairly evident that the team’s focus had switched to ensuring the win rather than extending the lead.